Mt. Ngauruhoe may be New Zealand's most famous mountain (explanation here, in case you missed our last post), but it is not the largest or most impressive. In fact, its closest neighbor, Mt. Ruapehu, is over 1000 feet higher and far more massive. 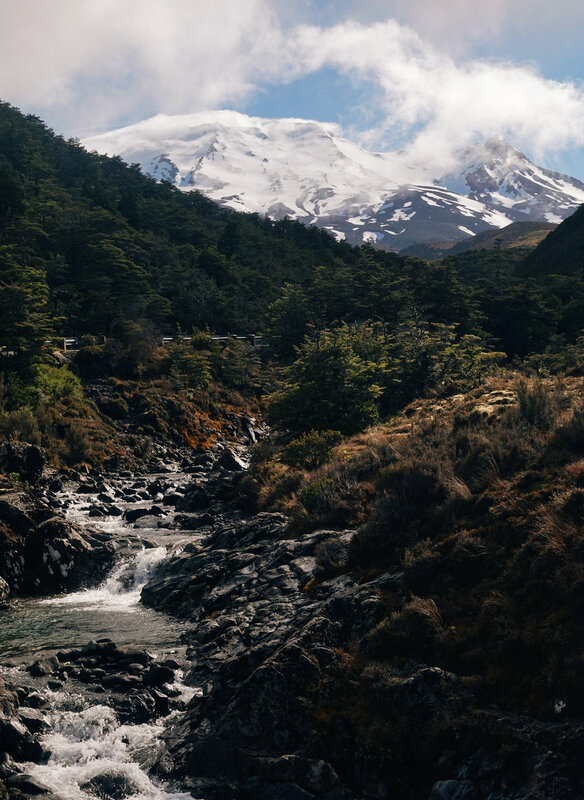 Ruapehu's highest peak, Tahurangi, stands at 2797 meters high (around 8400 feet) and boasts the North Island's only glaciers (so it is snow-capped year round). It is also still a highly active volcano; the last large eruption occured in 1996, but several smaller eruptions and lahars (large volcanic mudslides) have happened since. Though we're here in New Zealand to hike Te Araroa, we've also flown halfway around the world to get here -- we're not about to miss out on amazing sights just because they're off of the defined route. Case in point: the official trail spends only one day (30km or so) in Tongariro National Park. How could we not want to explore more of this amazing place?! The Round the Mountain track begins where the Tongariro Crossing ends, in the village of Whakapapa. It traverses between Ngauruhoe and Ruapehu, bends south to cross the Rangipo desert, then passes through deep beech forests high on the southern slopes of Ruapehu and crosses the epic Waihianoa Gorge. In total, it is just under 70km (~44 miles) of tough, remote terrain. NOTE: If you happen to be another hiker or traveler who's interested in adding this loop to your trip, I've added a bunch of extra info to the end of this post, including some links and resources that we found helpful, as well as some tips for TA hikers, specifically. Scroll down to check that out or read on to hear about our adventure! The forecast for our side trip was mixed, but it looked like with a little luck, we might finally get a good look at Ruapehu, which had been hidden in the clouds since we arrived. We set out early from Whakapapa and the trail up to Waihohonu Hut was glorious. Though Ruapehu remained cloaked, we did get a couple more good looks at Ngauruhoe from the south. As soon as we left Waihohonu Hut, the trail turned toward the Rangipo Desert and the landscape began to change. The alpine scrub thinned until we were left in a sea of rock and sand. The desert was surreal after so many miles of dense, wet rainforest. And looking out across the undulating dunes, it was nearly impossible to guess how far we had come or how far we had yet to go. After Rangipo Hut, the track climbed higher up into the mountain gullies, wrought from sharp, black volcanic rock. In the clouds, there were no sounds but the wind and the crunch of our footsteps. In one valley, we found signs reading "EXTREME LAHAR DANGER." They cautioned us to move quickly through the next kilometer and not to pass through if we heard rumbling from above. A lahar is a massive mudslide caused by volcanic activity and the area was overdue. Definitely adds a little spice to constantly be reminded that you're hiking across an active volcano! The valley was also insanely beautiful, with bright orange mineral deposits against the opaque, ice blue river. Jonathan lived dangerously and paused to snap a quick photo of me crossing a narrow suspension bridge. One person limit! The end of the desert comes suddenly; a dense wall of beech forest seems to materialize from nothing, flowing upwards toward the summit over the bare lava. It is cool and shady under the trees and the trail is soft underfoot. Moss covers every surface and dampens the sound, so the world becomes quiet. I felt as though I should whisper. It was raining as we crossed the boardwalk to our hut that evening, Mangaehuehu. Day 2 was much clearer and the summit came out as we climbed Ohakune Mountain Road. The descent into the Mangaturuturu Valley was one of the most stunning parts of the hike. Everywhere around us, waterfalls poured from the cliffs and tumbled into cold, clear pools. And Ruapehu towered above. The final push toward Whakapapaiti Hut brought the gnarliest trail of the route. The track itself was washed out into a 4-ft deep trench filled with slippery mud. We climbed through thick, high grasses and did our very best to stay vertical, hopping between rocks and holding on to bushes as we clambered up and down the steep gullies. Our adventure ended with a bit of a race as we met up with the official TA again. Low on food, we needed to resupply in National Park before heading toward the Whanganui River for our canoe adventure. With the shop closing at 7pm, we thrashed our way through the brutal swampy terrain, each slipping and falling in the murky water more than once. But we managed to run the final 12 kilometers in under two hours, still, and made it to the shop with time to spare. We rewarded ourselves with burgers and ice cream at the local dairy. There are a few things that you need to know about this route before you head out. First, the piece on the Great Walk (between Whakapapa and Waihohonu Hut) is really quite mellow, but the rest of the trail gets a lot gnarlier. You may not go quite as fast as you think you will. Second, remember that Waihohonu requires booking in advance -- it doesn't really make sense to stay there, anyway, but if you do, make sure it isn't booked up. Your hut pass won't apply there. Finally, we used a bunch of resources to plan our trip, but the most helpful addition was this app for Android called NZ Topo Map. There's another one with a really similar name that we tested and that was totally useless, so make sure you get the right one! Iphone users may have more options -- if you use one you love, please add a link in the comments! The DOC site for Round the Mountain. Note that they don't include the ~3km or so ON the road in the totals (just up to and away from the road), so it's actually a bit farther than you think between the Mangahuehu and Mangaturuturu huts and there's a bunch of extra elevation gain. This ultrarunning site gives decent descriptions that add some additional terrain info and was the only place we could find info about the total elevation gain (~2000 meters). Michael Deckebach's blog is where we first found out about this trail and he has some additional info about this and other alternates for TA hikers. If you decide to go clockwise, like we did, the hardest terrain is toward the end of the loop. 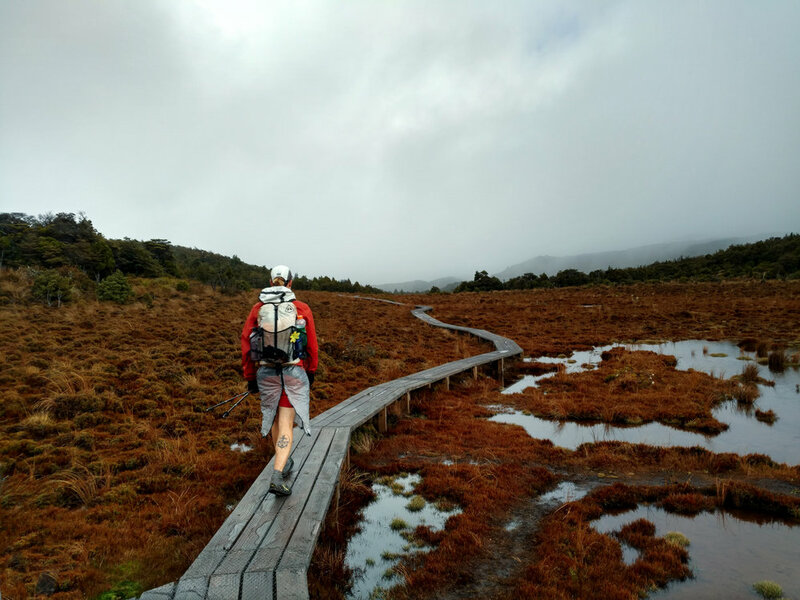 However, there are some advantages for TA walkers in doing it this way: instead of going all the way back into Whakapapa, you can head out to Whakapapaiti hut and rejoin the TA as it passes out toward National Park. One final note: everyone will recommend to you that this route should be done in 4-6 days. For us, doing it in 2 days (~35km each) worked out just fine. Be smart about your own fitness level and comfort, but if you're a fit hiker used to doing big miles, you may not need to plan quite so much time for the side trip.